We are excited to present you with our first edition of the Department of Animal Science Alumni and Friends News. We are committed to keeping you informed about activities, successes, opportunities and upcoming events at the University of Nebraska, Department of Animal Science. We plan to send you the Alumni and Friends News each Fall and Spring. Our department has a strong and proud history of excellence in Teaching, Research, and Extension, and we are striving to become even better in the future. We look forward to engaging you and sharing our vision as we continue to build on our culture of achieving excellence and advancing our animal industries. The faculty in the Department of Animal Science at the University of Nebraska continue to teach, conduct fundamental and translational research, and deliver research-based knowledge that is having an impact on our state, region, nation and world. In this issue of the Alumni and Friends News, you will read three feature articles about how research and technology are advancing all three areas of our tripartite mission. You will also learn that 14 faculty (35% of our total) tenured in the Department of Animal Science (including UNL Chancellor Dr. Ronnie Green) have won local, state, or national awards in 2017. In addition, several of our graduate students have been recognized for their outstanding achievements in research and oral presentation skills. 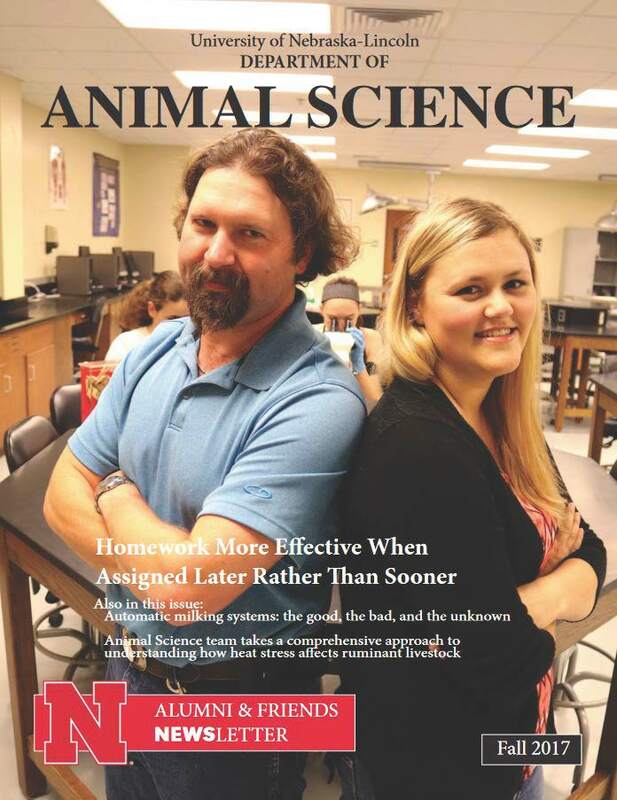 We are truly blessed with tremendous students, faculty, staff, and administration in the Department of Animal Science and at the University of Nebraska!